My immediate thought is that this may very well be the last game Claude Julien coaches in Boston. If the Bruins manage to scrape one game out of the next two I’ll consider it a win. I fully expect this team to get swept. The Bruins were fifth in scoring this year? Sure doesn’t seem like it. 1 goal in 120 minutes. Chara’s going to get a lot of flack for not suiting up tonight. He’s played with a broken hand in the past so I believe he had to be feeling real bad not to play. The medical staff could have told him ‘no’ when he wanted to go. We don’t know. Tim Thomas is going to win the Vezina this year but he was pretty sub-par tonight when he needed to be. The third goal needs to be corralled, Thomas has struggled with rebound control all series, Price has not. Bruins lack of discipline is a serious problem through the first two games. Killing their own power-plays and taking their frustration out at bad times says that this team doesn’t know how to win. Tomas Kaberle is worthless, there’s no way you can re-sign him in the offseason. This could go down as a terrible trade for the Bruins. Remember two weeks ago when the Bruins beat this team 7-0? Do you think the Bruins will even score seven goals this entire series? I don’t. 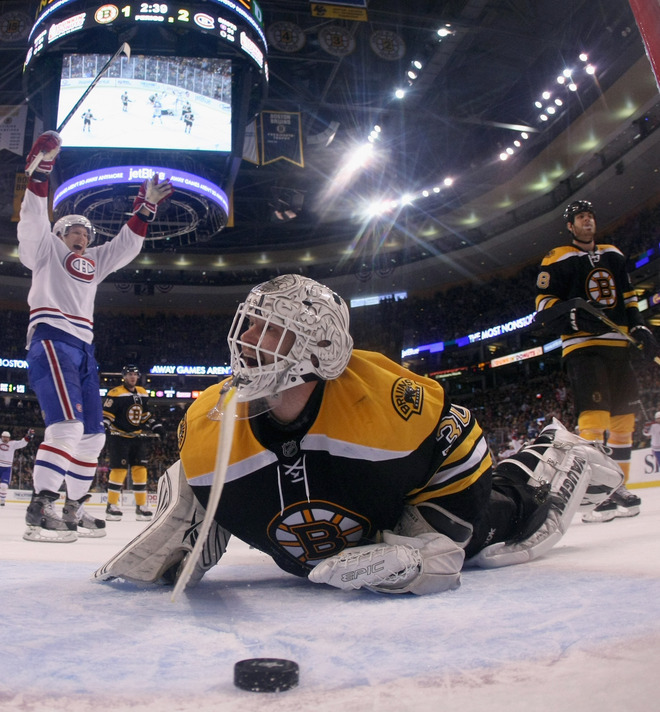 It’s almost a blessing in disguise that the Bruins are getting run out of town by the Habs. Blow up the coach and GM and make some personnel decisions. Claude and PeChi have taken this team as far as they can. Blow it up.